Sorry, but I don’t think it’s possible for me to write a post about a peach recipe without quoting lyrics from “Presidents of The United States of America”. In fact, I am making sure that you are similarly inspired by embedding the video at the end of the post, so you can just wander down here right now, and give it a listen while you read the rest of this. 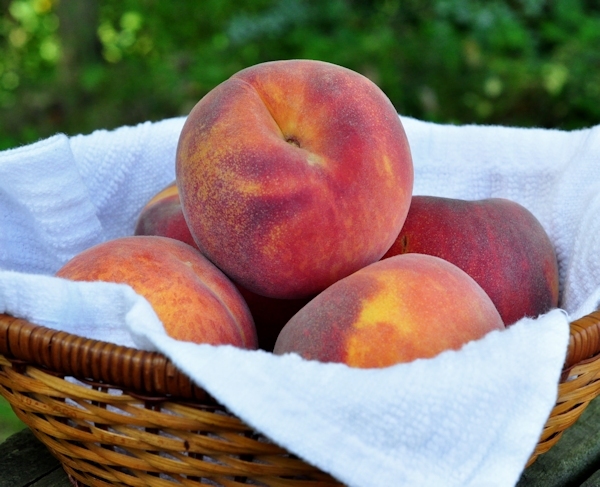 Unlike The Presidents though, we are going to have us some fresh peaches, and we are going to flavor them with cinnamon and ginger and then cover them with crunchy topped fluffy sweet biscuits. And then we are going to be very very happy. Although it is possible to grow peaches in Upstate NY, a lot of times it’s more of a theory than an actual fact. There are some varieties that will survive our winters, but that doesn’t mean you are always going to get any peaches, as our frequent late frosts often kill all of the blossoms before they can form fruit. We might give them a try eventually, but for now, we buy them, most usually from Pennsylvania, where the weather is just enough warmer to ensure a reliable crop. Like a lot of folks, I am not fond of the skin on a peach, particularly in something like cobbler, but it is easy to get rid of. If you are only peeling a few, as in this recipe, you can use a serrated peeler like this one. Or you can dunk them in boiling water for about 30 seconds, then into ice water, and peel the skin away fairly easily. That is how I do it if I am canning or freezing peaches, or making jam. Either way, peeled peaches are slippery suckers, so work over a large bowl to catch them when they inevitably get away from you. Preheat the oven 350º and generously butter a 3 quart flat baking dish. In a large bowl, combine the peaches, the first amount of brown sugar, cinnamon, ginger, salt and cornstarch, mixing well to completely combine. Spread the fruit mixture evenly in the baking dish and bake for 30 minutes. In the same bowl [no need to wash it], mix together the flour, baking powder, salt and the second amount of brown sugar. Cut in the butter, using a pastry cutter, your fingers, or two knives - the mixture should resemble coarse crumbs with some bigger bits of butter. Mix the buttermilk and vanilla together, and then fold it into the flour mixture. Don't over mix - you will have a shaggy looking dough. Remove the baking dish with the peaches from the oven, and using a medium cookie scoop, portion the dough over the fruit - or use a large spoon, pushing dough off it with your finger or another spoon. Sprinkle the top of biscuits with a tablespoon or so of granulated sugar. Return the baking dosh to the oven for another 30 to 40 minutes, until the top is nicely browned all over, and the peach filling is very bubbly around the edge. Scoop portions into bowls and top with vanilla ice cream, lightly sweetened whipped cream or creme fraiche with a bit of honey stirred in. 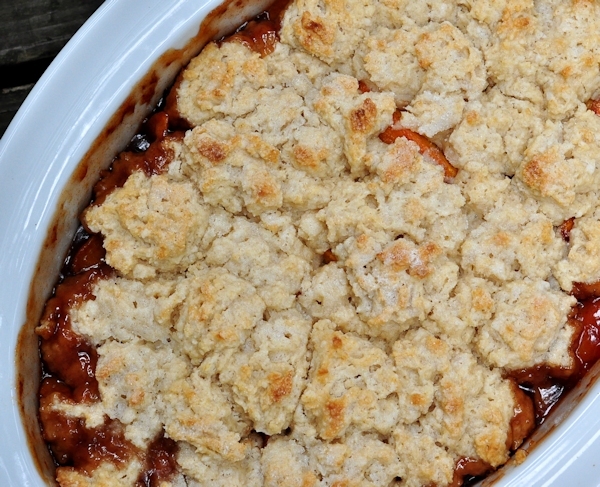 You probably won’t have to worry long about leftovers, but they should be stored in the fridge – you can warm the cobbler back up for serving if you like. 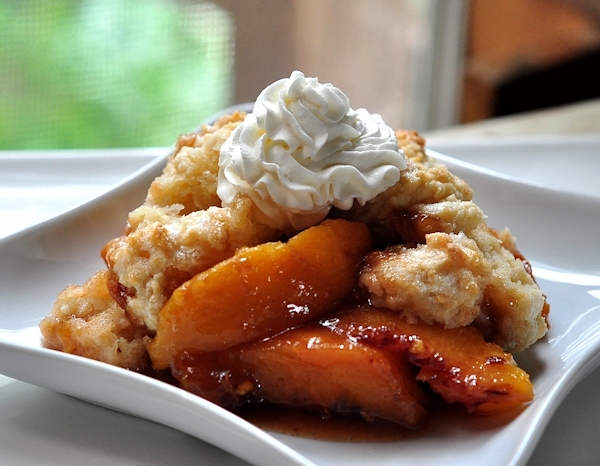 I am totally with you when it comes to the deliciousness of peaches and peach cobbler! 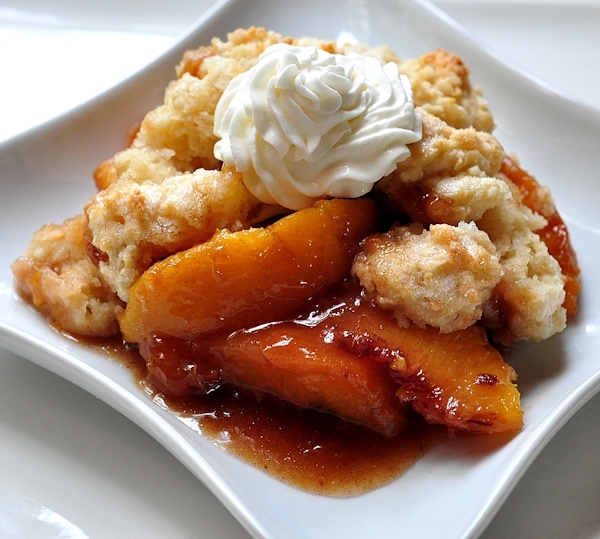 I really don’t think there is a better dessert on the planet than peach cobbler! Sue, you will get no argument from me about that! 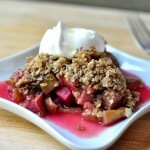 Cobblers are the best and this one with the peach is very summery and delicious! This looks amazing and I can’t wait to get some peaches and make it myself. My husband is going to be so so so happy! Thanks Lydia – I hope that you both enjoy it! Oh thank you CCU – I hope that you do! 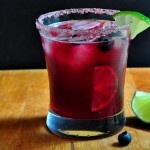 Oh wow that looks insanely delicious!! 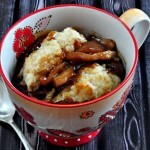 Peach cobbler is my all time favorite! It really is Jocelyn – wishing that it was not all gone! I’m OK with peach skin, but baked goods are usually better without it. So love the tip. 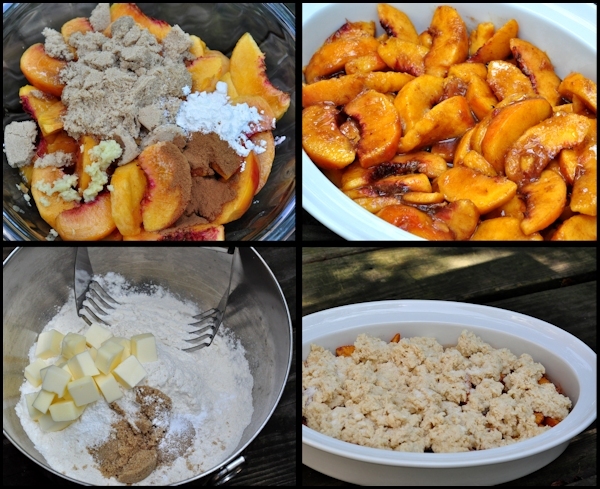 And the cobbler — peach is probably my favorite flavor when it comes to cobblers. Really good — thanks. Hi John – I was lucky to live next door to my grandparents when I was little – I could always get Grandma to peel my peach for me. And thanks for stopping by! It’s amazing! I made a crumble just two days ago… I wanted to make it tomorrow once more and now that i see your beautiful sunny peach cobbler, I think I’ll skip blueberries and buy peaches instead. I don’t like peach skin even when I eat peaches raw (I moist them with water to make the skin “edible” and also put into boiling water when I bake them or preserve them. Thank you for inspiration! Oh good Sissi – glad to have been the inspiration for you enjoying this! 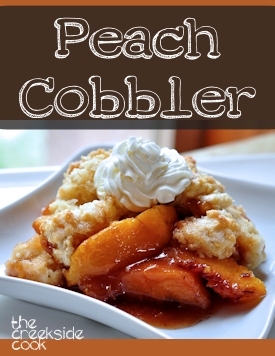 i love a good peach cobbler! craving a bowl now.. definitely a recipe i will be saving to recreate in my kitchen. love it! Thanks Thalia – I hope that you love it! I came across this on pinterest and pinned it for sweet treats and Christmas. I will definitely be making it soon. Thank you for posting! 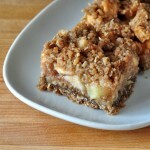 Thanks for the pin, Sarah – I hope that you enjoy the recipe! I’m with you – I don’t like the peel in a cobbler either. I’ve never made a cobbler with a biscuit type topping. 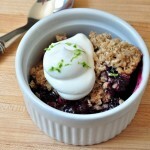 Yours looks quite delicious and I DO love that buttermilk biscuit topping!